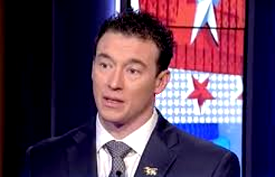 Carl Higbie is a Trump apologist who, while admittedly way glib and a masterdebater, makes disingenuous arguments and drives viewers up the wall. "NO, I DON'T agree with that, and here's why." He also uses the deflection technique of challenging points that no one has made. I'm aware Higbie is appearing on every cable news channel right now, asserting that "all new presidential administrations open back channels," knowing full well that the phrase back channel has, up to now, referred to AUTHORIZED dedicated lines of communication -- not conduits designed to circumvent our national security apparatus (as Jared Kushner's proposed Russian embassy "back channel" would have done). Higbie should be told that if he again opens the discussion with that assertion, he will be marginalized on the panel and receive no future invitations.